Rakı or Aslan Sütü: the National Drink of Turkey! Aslan sütü literally means ‘lion’s milk’, aslan being a metaphor for a strong, courageous man so this in turn gives this phrase the meaning of ‘milk for the strong’. It has, after all, a 45% alcohol content! A few months’ ago or was it even last year, it was proclaimed that ayran, the natural yogurt-based drink, was actually the national drink of Turkey. Well, this suggestion was derisively laughed out of town. And make no mistake: this is a strong drink! It is similar to many drinks around the Mediterranean such as pastis, ouzo, sambuka, arak and aguadiente. I only know about pastis which rakı resembles as it an aniseed-based drink made from grapes, but the way of drinking it is quite different. Pastis is an aperitif whilst rakı is not. 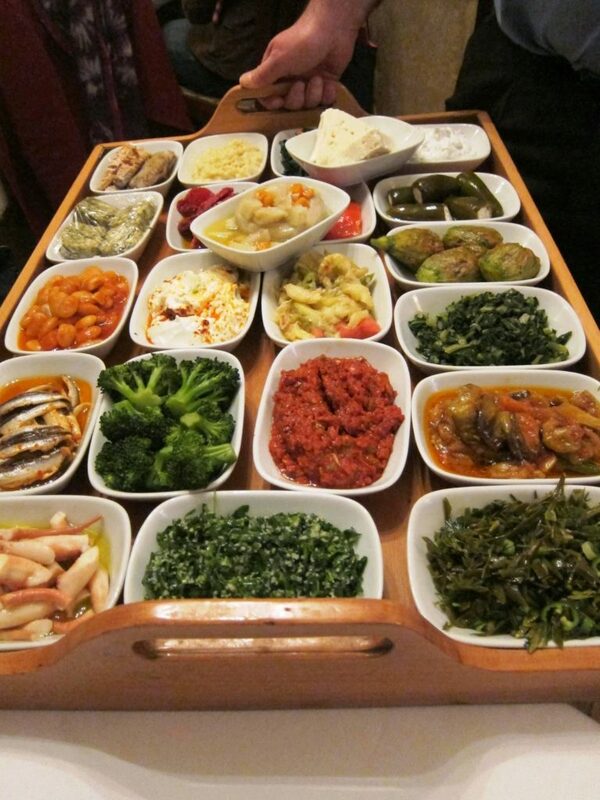 Rakı is always drunk alongside meze, numerous little plates of delicacies which appear on a tray for you to choose from, or at a specific rakı sofrası or rakı table, with perhaps a main course at some later point. 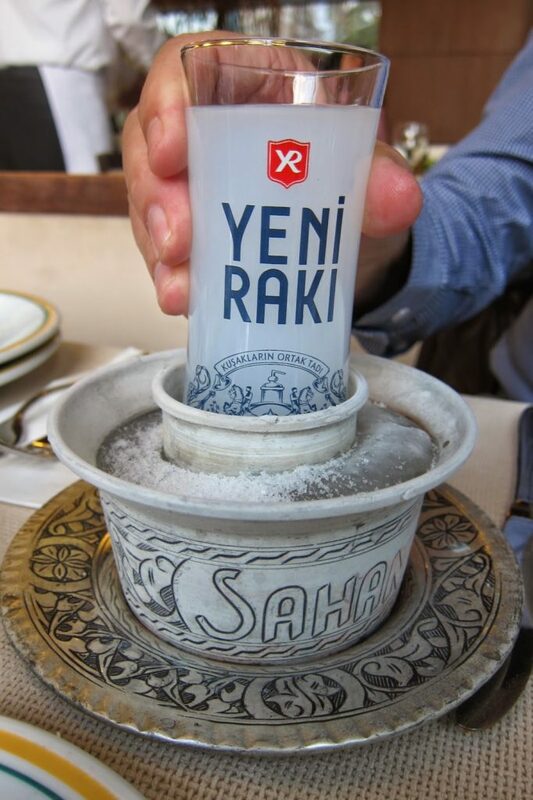 You will find rakı being consumed in the many meyhane/drinking places around İstiklal in Istanbul: I love the sight of packed tables in the little streets around the Çiçek Pasajı in Beyoğlu full of people talking volubly and enjoying a glass or two of rakı! Winter or summer, it’s a heart-warming scene and it reminds you that this is a secular country after all. Rakı‘s a very sociable drink: you don’t knock it back but rather sip it slowly savouring the aniseed-taste, over a few hours. The idea is to sit, chat, and enjoy an extended evening with friends. You order either a ‘duble‘ or double, or a ‘tek‘ single. 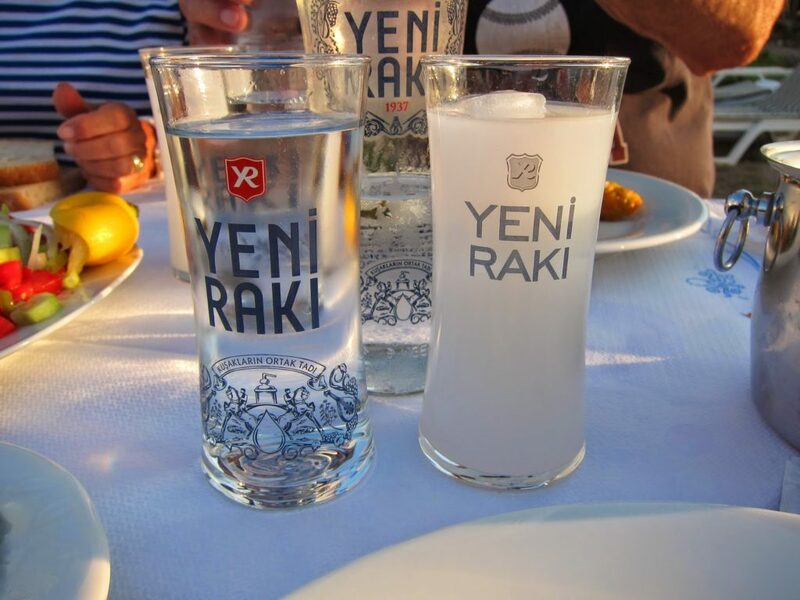 Rakı is usually diluted with chilled water and ice cubes may be added; next to it is a second glass of chilled water. Getting the proportions right is vital to the drinking enjoyment! In fact, it’s all part of the ritual. TT doing exactly that: getting the proportions right! 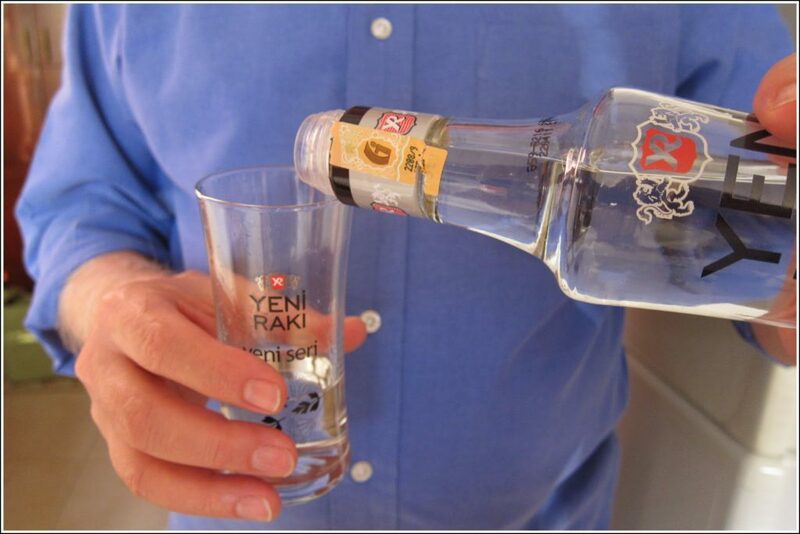 The addition of water to the rakı immediately turns the water a distinctive milky white and the first sip is incomparable! 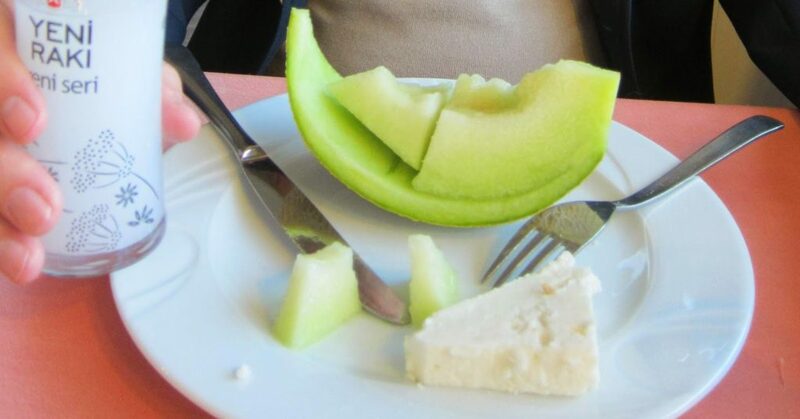 Have you ever seen an ehlikeyif? 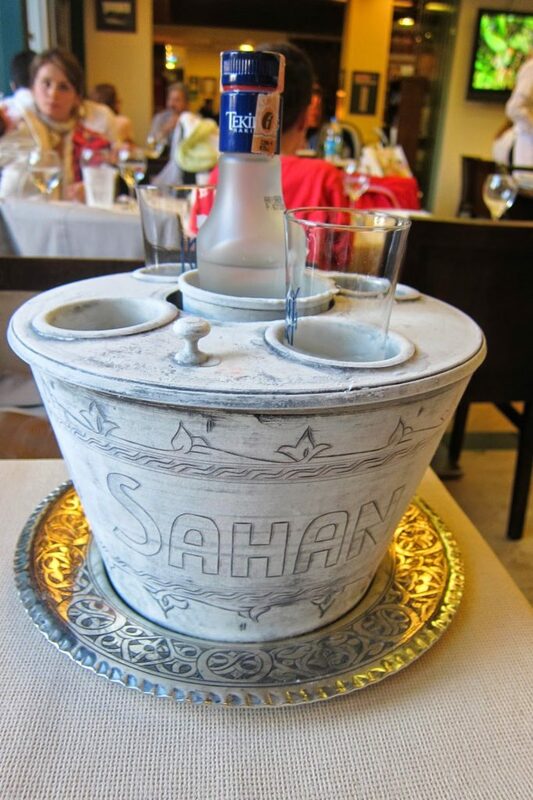 a decorative and effective way for keeping your rakı icy cold! and here is a monster ehlikeyif which I spied at the table behind us at Sahan in Suadiye recently. Judging by their appearance, I thought they dated back to Ottoman times but apparently not: they have only been around for the last ten years or so. But they look great, don’t they? We have some in our freezer at all times! Ehlikeyif means a person who enjoys pleasure! So now summer is here, the time when many Turks head for the coast, either the Aegean or the Mediterranean, to their summer houses/yazlık, where they gather with friends and family. As indeed we will be doing very soon. 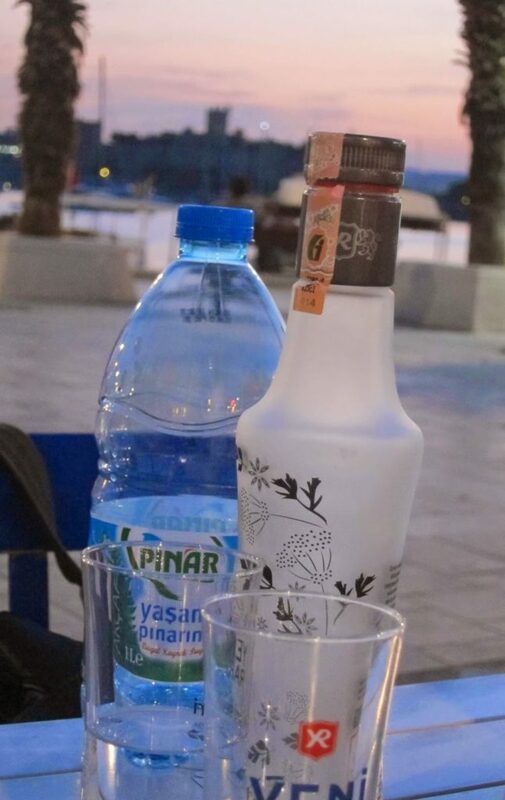 I know that the pleasure of a glass of rakı beside the sea is a very attractive proposition. Ramazan is fast approaching, however: yet again it’s during summer, a whole month of fasting during daylight hours. It is very strict as nothing, but nothing, not even water, can pass your lips during this time. Many people prefer to stay home rather than go to the seaside for the duration: presumably it’s easier to avoid temptation this way. But one good thing about Turkey or at least western Turkey: you are never ostracized if you eat or drink while others are fasting. 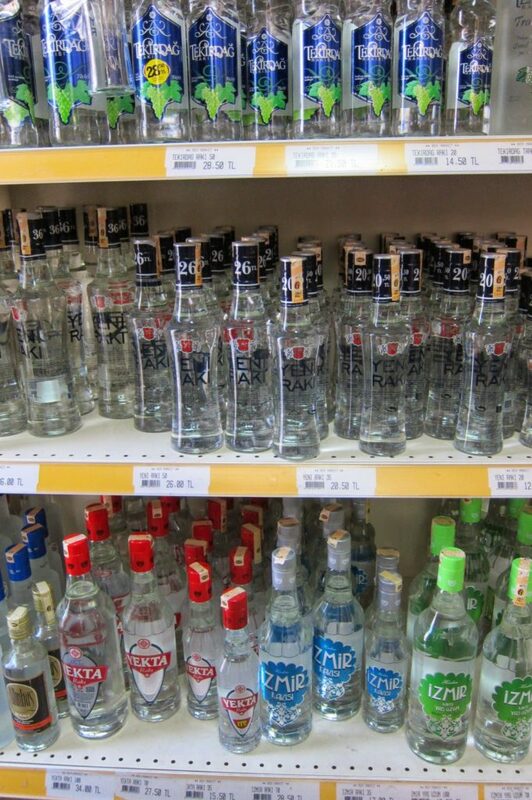 many different varieties of rakı at our little local supermarket in Ayvacık of all places! So when you raise your glass of rakı with friends, what you say is ‘şerefe‘ so I say a heartfelt şerefe to you all – have a wonderful summer! Previous Post: « Bread-making in a Turkish Village for a Circumcision Celebration!